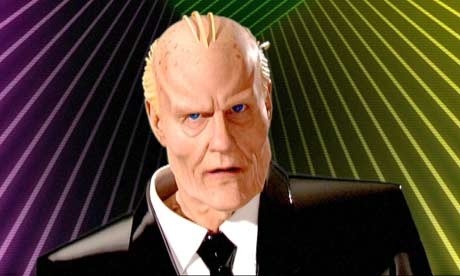 Difference between revisions of "Max: Advertising"
Max Headroom was basically born as an advertising avatar, to promote both the new Channel Four and his own initial show. He has been used by a number of advertisers since, including a late return to Channel Four. Data on Max's advertising appearances is incomplete, and updates and additional information are solicited! Let's just-just get this out of the way: If someone knows Max for just one thing, it's either the ABC series or the massive advertising campaign for the second rollout of "New Coke." The intersection of Max and New Coke is so large and significant that it will eventually have its own subsection here on the site. Let's just-just get this out of the way: If someone knows Max for just one thing, it's either the ABC series or the massive advertising campaign for the second rollout of "New Coke." The intersection of Max and New Coke is so large and significant that it will eventually have [[Max: The New Coke Campaign | its own subsection]] here on the site. Yes, that's right, it's another stay tu-tuned. Sorry. The original purpose of Max was to draw attention to the UK's Channel Four and his own talk/video show thereon. There's not much more to say about that, as everything that followed is documented throughout this site. Very much a case of "the medium is the message" - except that Max was more of a l-large than a medium. Ad from the Record Mail, 19 July 1986. George is a common enough name, but I like to think Max is referring to his creator, George Stone. Despite being the most obvious and available product pitchman of his era, Max's only straight-out gig for a general consumer product was his appearance in television and print ads for Radio Rentals, a TV-rental service in the UK. A print ad, which strongly resembles a storyboard for a video commercial, appeared in UK newspapers. There were also four television advertisements, none of which followed that storyboard, oddly enough. 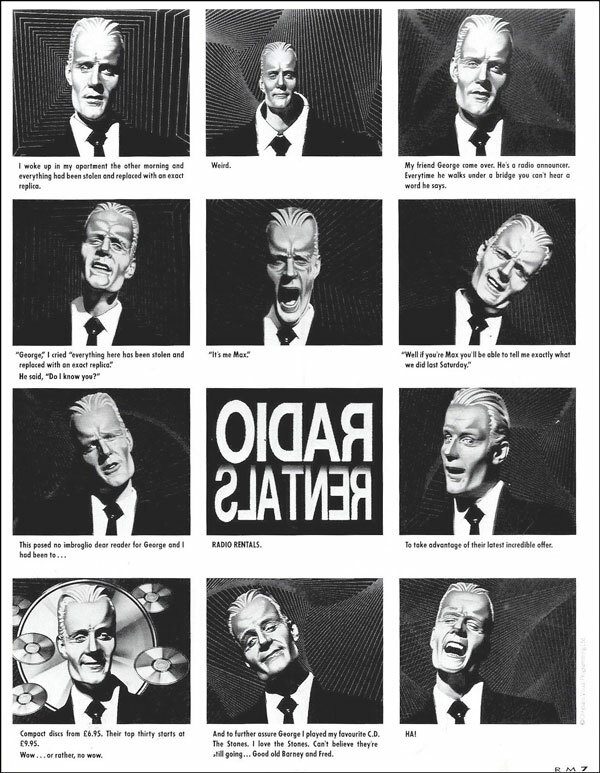 The ads were reportedly produced by Rocky Morton and Annabel Jankel, and followed the visual format of the video/talk shows, especially the full-screen titles. When Channel Four and its subsidiary channels (and how very "twenty minutes" that is) were prepared to switch over to digital service, they hauled Max out of cold storage and used him in a series of ads promoting the change. Six ads, running from about five seconds in length to just over a full minute, were produced in late 2007 and rolled out on December 1, 2007. Original producer/director Rocky Morton was called in for the project, along with Matt Frewer in his first return to Max makeup since 1989. Max was given new "old age" prosthetics, makeup and effects, and presented as being in a retirement home in his old-fashioned, six-channel tube TV.